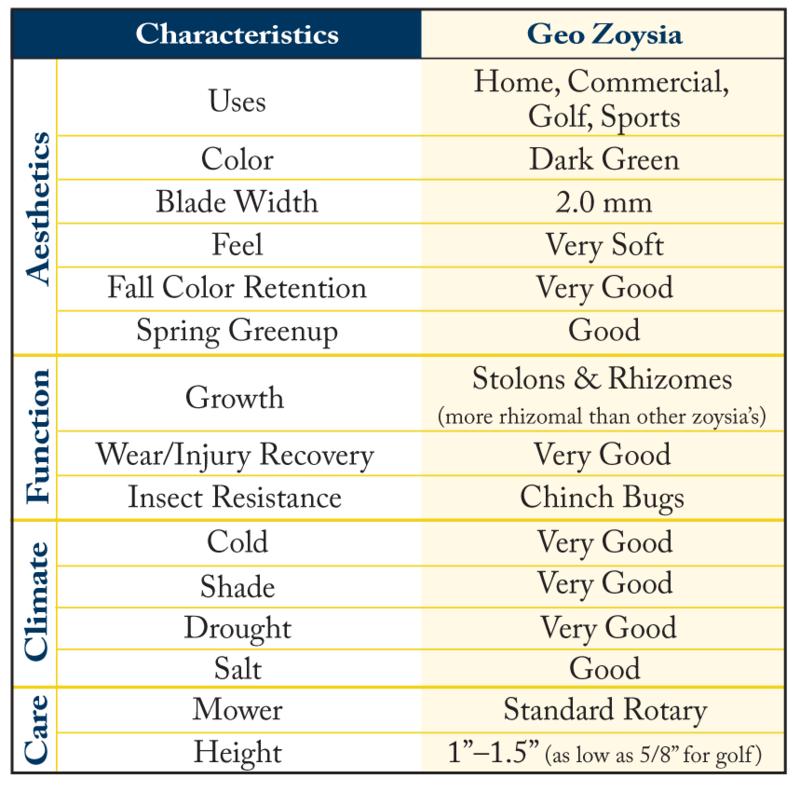 Geo Zoysia is a cross between a Zoysia japonica and a Zoysia tenuifolia that offers specifiers, landscapers, golf course designers, sports turf managers and homeowners exceptional performance with low maintenance across a wide spectrum of applications. Geo is a dark-green turf grass with fine-textured leaf blades that grows in a wide variety of soil and climate conditions. Geo performs well in sandy and clay type soils throughout the southern U.S. and has tough runners, rhizomes, and deep roots that provide excellent sod strength, wearability, and improved drought tolerance. Geo performs well in hot, arid, sandy areas of the southwest U.S., and has proven itself drought tolerant in many challenging applications. Geo has very good shade tolerance and has performed well in field and homeowner sites. Its shade tolerance is better than that of most Zoysias and it performs well into the transition zone. Additionally, Geo is highly tolerant of most herbicides making it easier to control weeds during production and for the end user.